Exercising your dog is one of the most important things you can do for them – it’s right up there with feeding and watering. Proper exercise not only keeps a dog’s body healthy, but also keeps their minds sharp. A tired dog is always more open to training and will display much fewer destructive behaviours, like chewing on TV chords!~! Exercise can even sometimes help with issues like separation anxiety. Exercising with your pup is a great bonding experience, and besides, it’s fun and good for both you and them! Walking is generally the most common form of exercise people choose to do with their dogs. But can be a good idea to mix things up, and there may be times when you’re unable to give them a proper walk. So welcome to Part 2 of our Pet Exercise Series. 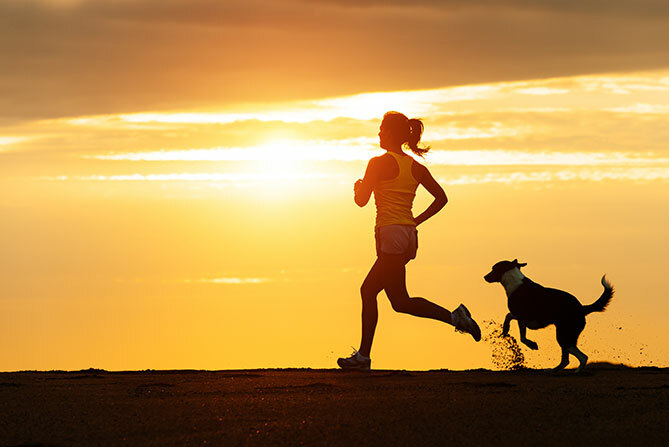 This time around we’ll be giving you lots of good tips for exercising with your dog. Walking is a universally great option for exercise, regardless of species. A brisk walk does wonders for a dog’s cardiovascular health, muscle tone, and flexibility. The great thing is that walking will give you those very same benefits. For healthy dogs, walking comes with very little risk of injury. To spice things up a bit, if your dog is up for it, you can also run with your dog as you walk. Start with short bursts on your walk, and then gradually add in running intervals. Remember that puppies should only have short walks, and never force them to run or speed up if they’re not ready. (This could cause inury). If the weather isn’t great, or if you have health issues that prevent you from taking your dog outdoors, a fun way to get them moving is with a treadmill. Start and stay very slow, and give them a piece of kibble at intervals to keep them motivated. Do not go fast on a treadmill, however, as there’s a risk that your pup will take a bad step and get injured. If your living quarters allow – you can also throw a ball down the hallway for your dog to retrieve! When you go out for a walk, also be sure to let your pooch have plenty of time for “scratch and sniff” and time to leave the pee-mail around the neighbourhood. This is a vital part of dog behaviour and is important for their mental well being. Swimming is a fun option for dogs who may suffer joint issues. Get a floating ball or another fun swim toy and play fetch while they swim out to retrieve what you throw. Swimming does also come with dangers, however, so make sure your dog isn’t getting too comfortable in the water and swimming out too far. Make sure you keep your throws relatively close to shore to keep your doggy safe. Play is exercise too! It’s also a vital way for you to bond with your dog. You’ll never feel closer to each other than when you and your pooch play around and have a good time together. If you have a large enough garden, throw a dog-safe ball from one end to the other and play fetch. For larger, faster dogs, this is a great way to get them sprinting as chances are you wouldn’t be able to keep up with them during a sprint in the middle of a walk. If you have several dogs, or your dog has his own friends, free play is a great way for them to socialise and get a good workout. They’ll chase each other, wrestle, and generally have a fun time. Play is great for your dog, not just physically but also mentally. It keeps their minds engaged and focused, and they learn to socialise and make friends. Play doesn’t have to mean simple fetch or wrestling with other dogs. There are lots of fun things you can do with your dog to spice things up a little. You can set up an obstacle course with chairs, brooms, or whatever else you may have lying around the house. Lead them through with a treat a few times until they figure out what they’re supposed to do. You can do this both indoors and outdoors. Another fun idea is to play a game of hide and seek. Get your dog to stay while you go hide somewhere inside. Call out for them and see how long it takes for them to find you. Make sure to give them a treat if they’re successful! Heads up: dogs are actually really good at hide and seek. It activates their tracking and sniffing instincts, and keeps them focused. If you and your dog are physically able, you can also race up and down the stairs. It’s another great workout, and your pooch will love competing with you. If you’re finding you’re unable to provide enough play or exercise to satisfy your dog’s needs, there’s also the option of enrolling your dog in agility or exercise classes. These will give your pooch an extra boost in their exercise regimen in a safe way, while you can learn even more about training and developing your dog. Exercise is vital to a dog’s health and well-being, as well as to the harmony of a home with a well-integrated dog. Keep your dog and your family happy and healthy by exercising together every day.